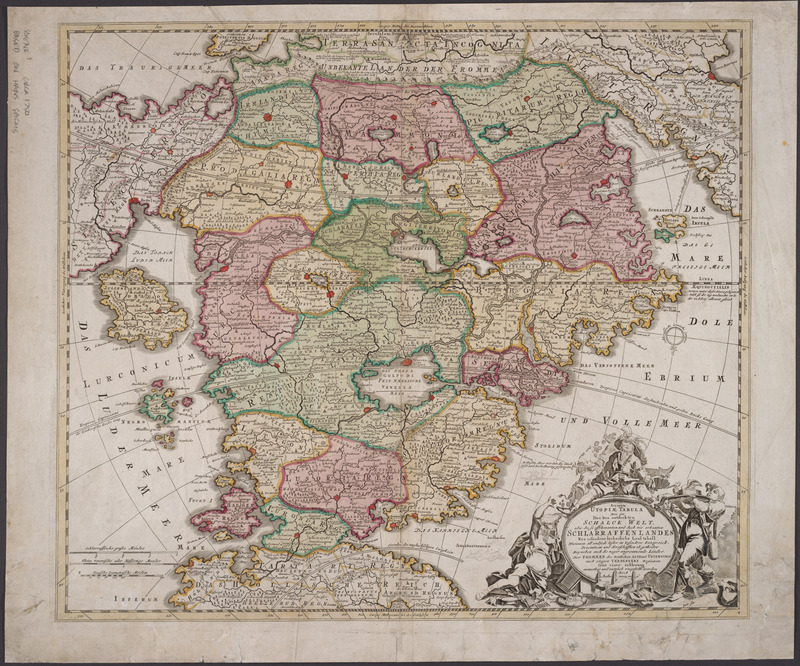 "The largest and best-known literary map in the German language is certainly Johann Baptist Homann's 'Accurata Utopiae Tabula...' which was printed for the art dealer and publisher Daniel Funck at the end of the seventeenth century together with a comprehensive explanatory book, 'Erklarung der wunder-seltzamen Land-Charten Utopiae' by the military officer Johann Andreas Schnebelin in 1694." Reitinger 2007, 438; see generally Delaney 2012, 218-19; Goss 1998, 335-36. Schlaraffenland (one "r" in the original) is a special "Utopia," a place of avarice, drunkenness, gluttony, indolence and just about every other moral failing one might catalog (along with some perhaps lost to history). It is based on the 16th Century satirical work of Hans Sachs, which in turn reflects the medieval English Cockaigne, French Cocaigne and Italian Chucagna. See Hinrichs 1955 (which includes a translation of Sachs into English, "purged of some vulgarities"). The word Schlaraffenland is derived "from the Middle High German slur-affe, lazy ape." Wolf 2004, 61 n.1. The land is found between the 360th and 520th meridians. At the top of the map is "Terra Sancta," which is -- not surprisingly -- "Incognita." At the bottom, and presumably better known to the residents, is Hell ("Das Hollische Reich"), with locations for "Beelzebub," "Satan" and "Lucifer." In between, "The map is literally covered with place names, over 1700 in all, denoting the cities, fortresses, villages, rivers, mountains, lakes, islands and oceans of Schlaraffenland's twenty eight empires, kingdoms, countries, and provinces, often with amusing and sometimes indecorous meanings." Wolf 60. For details, see Barron, Rod, http://www.barron.co.uk/Imaginary+Maps+Pt+1/item1105?startPos=, accessed November 24, 2014. Later editions of this map bear the names of Homann or Mattheus Seutter, but this edition states only "Author anonymus." It is sometimes attributed to Pieter Schenck because it first appeared in editions of his Atlas Contractus and often appears in Dutch publications (see, e.g., Baynton-Williams 2015, 66), but the research by Reitinger suggests that it was created by Homann in Nuremberg.